Note: I tried really hard to write this without referring to too many plot points, but I just couldn't make it work, so if you don't want to know what happens in the movie, don't read any further. But you won't leave empty-handed. Enjoy this! I really don't know what to make of this movie, but I also don't know if that matters, because most of it is really fun to watch. Visually it's lovely, with pretty locales, pretty people (Shashi Kapoor and Rakhee x 2), and an endless rainbow parade of fashion (I took over 100 screen captures, so if you want more, just let me know). I'm a big fan of both lead actors, and both deserve praise for handling with ease the varying components of their characters. Despite how much there was going on in the movie, with plot twists every fifteen minutes or so, I never felt that the characters themselves lurched. Shashi plays the good-natured but not-too-perfect Ajit with oodles of charm and truthful emotion; Rakhee gives different faces to each twin's pleasures, hurts, and secrets. It also has the Recommended Masala Allowance of family tensions, patriotism, and genuinely funny bits - and a few woodland creatures for good measure. Unlike some other masala movies, even Do Aur Do Paanch, which I loved, this one does not indulge in context-free action sequences (though it does have a surprisingly brutal scene involving one of the twins and a henchman). Okay, so that's all dandy. But for whatever reason, this didn't feel quite like a wholehearted masala romp. I think something additional is going on here, but I'm not sure what. If you want to puzzle it out with me, keep reading; if you'd rather just skip to the pictures at the end, by all means. If the twins are read as a lesson for India circa 1971, then it isn't a lesson that I can support. The bold, confident, independent woman is tarnished and turns selfish and cowardly - although whether she was that way all along or chooses it at a certain point in the story, I couldn't tell (which may be a subtitling problem, and I'll get to that) - and the pathologically shy woman is rewarded for absurd sacrifices she should never have made. I have a lot of questions about our two female leads. Was Kamini just a free spirit who got trapped up by a past indiscretion, or was she a spy all along who temporarily put aside her allegiance to the gang as her heart was lured by Ajit? I was troubled that the connection between these two sides of her character was not better explained - Filmi Geek and I discussed this problem, and she pointed out that certainly the Kamini who was bold enough to travel alone with her girlfriends, break into an army base, and stand soaking wet cheering on a fight at a public swimming pool is not the Kamini who would obediently stay with the bad guys in the lair unless she really wanted to be there. As for Kanchan, her shyness - apparently significant enough in the story that it becomes the film's title - puzzles me too, and I can't tell if the film is saying that this trait, which Kanchan embodies with a pitiable level of maladjustment, should be worked through, as she eventually does (at least a little bit), or if it is to be admired, as it is Kanchan's choices that eventually lead to the happy(-ish) ending. Maybe the shyness should be read with regard to its effects on how the characters manage their lives - inwardly, in the case of the frightened yet dutiful Kanchan, or outwardly, as the affectionate yet flawed Kamini? If I understand the ending correctly, duty wins, but the heroine learns to look outward and forward - but only accompanied by her smart, brave, balanced hero. Speaking of which, there might be another lesson in Ajit, who is both soldier and poet, lover and interrogator, hero and dupe. In Ajit we find traditional behaviors and responsibilities coupled with outgoing optimism and laid-back cheer. Not only do both women love Ajit, but Ajit also loves both women - though which version of each woman, it's harder to say. Ajit loves Kamini instantly but when he learns of her treachery is willing to dispose of her. While he rejects Kanchan initially, it's because of who she isn't, not because of who she is; when she finally displays some sort of personality beyond a quiet and slightly creepy crush, he likes her well enough. Then again, the distracting visuals and charming performances are more than enough to make me not worry too much about the message. 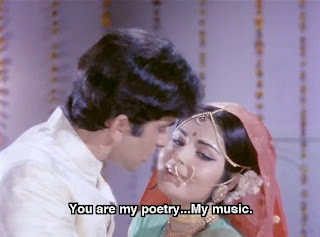 It's really, really fun to watch Rakhee and Shashi flirt their way through the various pairings and encounters, especially when she smiles with big-hearted affection or when he leans in dangerously close with poetic sweet-talk. Seriously, there was a scene in here that curled my toes, and I even tried to get a sound recording of him saying "You are my poetry, you are my music" - as cheesey and ridiculous a line as they come, but you can just feel the attraction oozing out of him, and he murmurs soft and low, tapering off on sangeeeeeet...oooof. Yum. Damn. Etc. I watched this line of dialogue several times before I realized that in fact he doesn't really say or do any of this: this scene only happens in Kanchan's imagination - a phenomenon I know all too well. Her fantasy sequence also involves a lovey-dovey happy family bit, with them cradling a newborn, whom he twirls about and tosses in the air - and then drops, and her dream world comes crashing down just as hard. It's really quite funny. I didn't like this movie a whole lot. Shashi looks good in Uniform, I have to say. I think Shashi looked great in "Satyam Shivam Sundaram", did you see that one yet? "Not only do both women love Ajit, but Ajit also loves both women - though which version of each woman, it's harder to say." is genius, and it's given me an additional thought. Ajit does love both women - not just that he loves an amalgam of the two women: Kanchan playing Kamini. And since Ajit is the seedha-saadha hindustani ladka, the sensitive good boy and the patriotic soldier, of course what he loves above all is India. In other words, India = the Kanchan-Kamini hybrid.